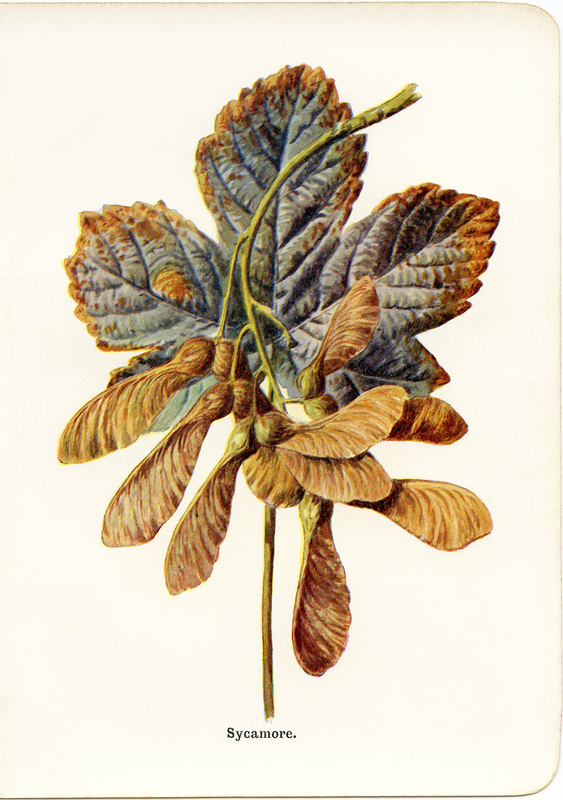 Here is a vintage botanical illustration of a sycamore leaf and fruit. 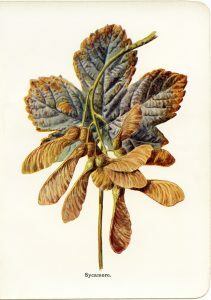 In reference to the fruit, the article in the book states, “One venerable author describes the arrangement as “fruit fastened together by couples, one right against another, with kernels bumping neere to the place in which they are combined: in all the other parts flat and thin, like unto parchment, and resembling the innermost wings of grasshoppers.” I scanned the original image from Wild Fruits of the Country Side by F. Edward Hulme, 1907. This is lovely and great for fall. I was puzzled by the maple looking seed pods, so looked this up. This is actually an English Sycamore Maple. The true American Sycamore does not have the winged seed pods. Just FYI. Thank you, Peggy, for the additional information. I appreciate it and love learning new things like this. Hi Julie, I know I don’t often say thanks but from the bottom of my heart please accept this as my sincere thanks for all the beautiful images you so generously give us. They are all so unique and I absolutely love them. cool texture in the leaf!